Anyone familiar with Mike Pence’s politics knows that he’s deeply committed to ensuring that American law adheres as closely to Christian morality as possible, but today the vice president took his dedication to scripture one step further. Mike Pence just proved how committed he is to sexual purity by instructing his Secret Service detail to riddle him with bullets if his hands ever go below his waist. Now that’s a politician truly dedicated to practicing what he preaches! 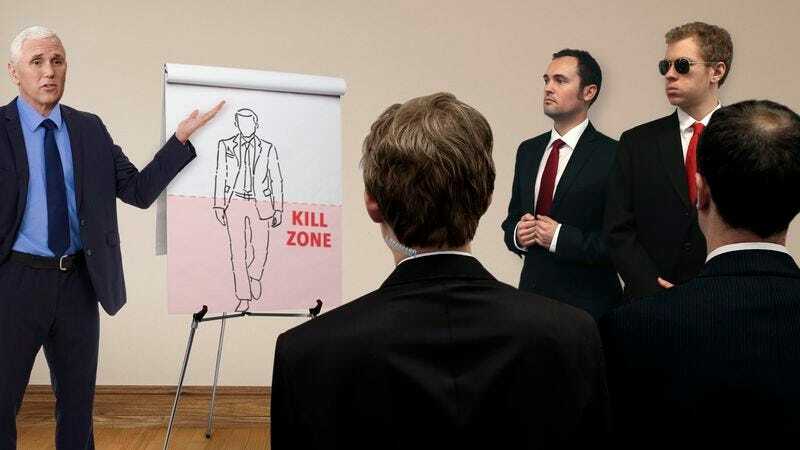 Pence issued the orders this morning during a meeting with his personal security detail, in which he presented a diagram of his body indicating the clearly labeled “kill zone” below his belt line where his hands are forbidden to go under penalty of death. Say what you will about the vice president, but you’ve got to admit that he walks the walk! According to Washington insiders, Pence’s instructions about what to do if his hands go below his waist were clear and firm: If any member of Pence’s Secret Service personnel notices that the vice president’s hands have slipped below his belt line, they are instructed to empty every round of ammunition at their disposal into the vice president’s body in order to be absolutely certain that he cannot engage in any immoral activities that would compromise his spiritual purity. Pence also posted several snipers across multiple D.C.-area rooftops with the sole purpose of keeping him in their sights so that if they see his hands anywhere near the vicinity of his erogenous zones they can take him out with a swift shot to the head. Now that’s the kind of commitment to your ideals that makes you an effective leader! Mike Pence might expect a lot of the American people when it comes to sexual chastity, but he just proved that he holds himself to the same strict moral standard. Here’s hoping Pence’s attempt to keep his hands safely above his waist for the rest of his life is a success. Otherwise we may need to find ourselves a new vice president!